Yellowstone Treasures: Home / Author Blog / The "Haynes Guides" and "Yellowstone Treasures"
Reading about a recent Haynes Foundation Grant to Montana State University has inspired me to write the story of how the Haynes Guides came to father Yellowstone Treasures. Back at the end of the last century the director at the Haynes Foundation generously allowed me to use any quotes I wanted from the Haynes Guides in my new guidebook. Now the foundation has given a generous grant to fund scholarships to undergraduate students at Montana State University. F. Jay Haynes was the official photographer of Yellowstone Park in its early years. He and his son Jack Haynes owned photo shops in the park. Jack was also a photographer and earned a degree in geology before he returned to work in Yellowstone. They made a good living creating and selling photographs and postcards as well as guidebooks—as the grant announcement tells us, they “opened the wonder of Yellowstone National Park to generations worldwide.” Near the end of Jack’s life, having lost their only daughter at a young age, he and his wife Isabel created the Haynes Foundation to help deserving Montana students at the university (then called a college) in Bozeman. 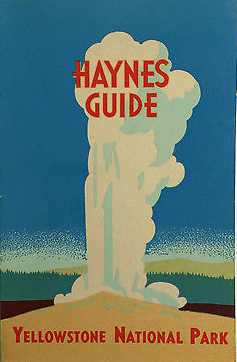 My family used the Haynes Guide (then titled Haynes New Guide: The Complete Handbook of Yellowstone National Park) while living in the park for four summers, 1939 through 1942, and also during visits we made to the park in later years. Fast forward about a half century to 1995, when a friend of mine named Bob English casually suggested we get together and update the Haynes Guide—last published in 1966. Bob had recently retired from his law practice, was looking for something to occupy his time, and surprised me months after that first suggestion by sending me fifty pages of the guide laboriously typed out on his computer. About then I was also thinking of doing something different, having spent all my adult life up to that time as a performer and teacher of cello in Rhode Island. I began investigating whether the type of guide I had in mind existed. A year or so later Bob dropped out of the project. However, I was hooked and began visiting Yellowstone at least once every summer. My husband Bruno Giletti was my “field assistant” and photographer as well as geological expert. Here are a few of the ideas I took from the Haynes Guides, in addition to using the text in order to check what was the same and what had changed since 1966. Bob had eventually typed out the complete text, and I owned my own copy of the Guide. Now I own ten different copies, ranging from the 1898 edition to the last. Old Faithful Geyser is shown on the cover. The descriptive text segments begin at the most popular West Entrance and proceed to the other five entrances counterclockwise. Features are located throughout the park with mileage indications. Many maps have animal pictures on them indicating where you may see a black bear, a wolf, or a herd of bison. A thorough index is supplied: the 1966 Haynes Guide has 22 pages of index for a 170–page book. The father and son team published their guide for 70 years. While Granite Peak Publications is unlikely to duplicate that longevity, we are in fact a mother-daughter team. Publisher of well-researched titles on Greater Yellowstone. Before passing the reins to daughter Beth Chapple in 2014, founder Janet Chapple named the company to honor her grandfather Fred Inabnit, who led climbing expeditions in the early 1900s into the Beartooth Range. That's where Granite Peak, the highest mountain in Montana at 12,807 feet, is located. Copyright 2019 Granite Peak Publications. All Rights Reserved.